Unofficial and preliminary election 2018 results on Thursday showed the Pakistan Tehreek-e-Insaf (PTI), led by cricketer-turned-politician Imran Khan, is set a secure a comfortable victory in National Assembly and Khyber Pakhtunkhwa (KP). As PTI workers from across the country celebrated the results, the outgoing Pakistan Muslim League-Nawaz (PML-N), Pakistan People’s Party (PPP) and other major political fronts flatly rejected the suggested outcome, citing “outright rigging” and accusing officials of preventing its representatives from overseeing the count. As the results started pouring in an hour after the polling process concluded at 7 pm across the country, the preliminary results show majority constituencies where PTI is leading the competition. NA-1: Muttahida Majlis-e-Amal candidate Maulana Abdul Akbar won with 4,8602 votes, while PTI’s Abdul Latif stood second with 40,002 votes. NA-2: PTI candidate Haider Ali emerged victorious with 60,989 votes while PML-N’s Amir Muqam got 40,880 votes in NA-2, Swat-I. NA-3: PTI’s Saleem Rehman got 68, 162 votes in the Swat-II elections, where PMLN’s Shehbaz Sharif got 22,758 votes. NA-4: PTI’s Murad Saeed won the polls in NA-4 Swat-3 with 71,600 votes. Saeed is followed by ANP’s Salim Khan, who has secured 30,975 votes. NA-5: PTI’s Sahibzada Sibghatullah wins NA-5 Upper Dir polls by bagging 49,299 votes. PPP’s Najmuddin Khan stood runner-up with 28,736 votes. NA-6: PTI’s Mehboob Shah wins Lower Dir 1 with 54,723 votes while MMA’s Maulana Asadullah stands at second with 31,404 votes. NA-7: PTI’s Muhammad Bashir Khan wins from NA-7, Lower Dir 2 with 62,416 votes. He was followed by MMA’s Sirajul Haq who secured 45,918 votes. NA-8: PTI’s Junaid Akbar wins NA-8 Malakand by securing 81,310 votes. He has defeated PPP’s Bilawal Bhutto Zardari who came in second with 43,724 votes. NA-9: PTI’s Sher Akbar Khan is leading with 58,037 votes, trailing behind him is PML-N’s Kamran Khan with 38,358 votes. NA-10: PML-N’s Ibadullah Khan wins NA-10 Shangla with 33,804 votes. ANP’s Suder-ur Rehman comes in second with 32,780 votes. NA-11: MMA’s Afreen Khan wins in NA-11 with 1,58,59 votes. Trailing behind him is PML’s Mehboobullah Jan with 14,148 votes. NA-12: PTI’s Nawaz Khan has won the election in NA-12 Battagram by bagging 21,200 votes. Khan was followed by MMA’s Mohammad Yousuf, who attained 16,789 votes. NA-13: Independent candidate Saleh Mohammad won with 1,09,284 votes whereas, PML-N’s Shah Jahan Yousuf is at second place with 1,07,808 votes. NA-14: PML-N’s Mohammad Sajjad won with 74,889 votes. Sajjad is followed by PTI’s Zar Gul Khan with 59,638 votes. NA-15: PML-N’s Murtaza Javed Abbasi wins with 95,346 votes. PTI’s Ali Asghar follows with 81,845 votes. NA-16: PTI’s Ali Khan Jadoon has emerged victorious from NA-16 Abbottabad-2 by securing 91,770 votes. Jadoon was followed by PML-N candidate Malik Mohammad Awan, who bagged 57,995 votes. NA-17: PTI’s Umer Ayub Khan won the election in NA-17 Haripur after he attained 166,786 votes. PML-N’s Babar Nawaz Khan stood runner-up in the polls with 149,292 votes. NA-18: PTI’s Asad Qaiser wins from NA-18 Swabi 1 with 78,970 votes. He was trailed by MMA’s Fazal Ali who bagged 34,217 votes. NA-19: PTI’s Usman Khan bagged 83,903 votes, whereas runner-up was ANP’s Waris Khan with 53,288 votes. NA-20: PTI’s Mujahid Ali wins NA-20 Mardan 1 with 78,140 votes, defeating ANP’s Gul Nawaz Khan who got 38,713 votes. NA-21: ANP’s Ameer Haider Khan won with 78,911 votes. He is followed by PTI’s Mohammad Atif with 78,878 votes. NA-22: PTI’s Ali Mohammad Khan wins NA-22 Mardan 3 with 58,577 votes. He has defeated MMA’s Maulana Mohammad Qasim who received 56,318 votes. NA-23: PTI’s Anwar Taj leads with 11,796 votes. He is followed by MMA’s Haji Zafar Ali with 9,357 votes. NA-24: PTI’s Fazal Muhammad Khan win in NA-24 Charsadda with 83,495 votes. ANP Chief Asfandyar Wali follows with 59,483 votes. NA-25: PTI’s Pervez Khattak emerged as a winner with 82,118 votes and was trailed by PPP’s Khan Pervez with 35,658 votes. NA-26: PTI’s Imran Khattak won with 90,256 votes. ANP’s Jamal Khan Khatak came second with 47,132 votes. NA-27: PTI’s Noor Alam Khan wins NA-27 Peshawar 1 with 71,158 votes. MMA’s Haji Ghulam Ali is runner-up with 39,310 votes. NA-28: PTI’s Arbab Amir Ayub secured victory in NA-28 Peshawar 2 with 74,414 votes. He was trailed by MMA’s Sabir Hussain Awan 27,292 votes. NA-29: In the Peshawar III constituency, PTI’s Nasir Khan won with 49,762 votes with MMAP’s runner-up Naeem Jan with 29,357 votes. NA-30: PTI’s Sher Ali Arbab wins Peshawar 4 with 73,781 votes as MMA’s Arbab Najeebullah Khan stands second with 18,111 votes. NA-31: PTI’s Shaukat Ali won in the NA-31 Peshawar V constituency with 87,895 votes, with ANP’s Haji Ghulam Ahmed Bilour in the second place with 42,476 votes. NA-32: PTI’s Shereyar Afridi won with 82,248 votes. Afridi is trailed by MMA’s Gohar Mohammad Khan Bangash with 47,412 votes. NA-33: PTI’s Haji Khayal Zaman emerges victorious from NA-33 Hangu by securing 27,734 votes. He is followed by MMA candidate Attiqur Rehman, who bagged 24,197 votes. NA-34: With 77,181 votes PTI’s Shahid Ahmed Khattak won the polls, whereas PPP’s Nawabzada Mohsin Ali has bagged 41,200 votes. NA-35: PTI Chairman Imran Khan won the elections with 1,13,822 votes. He is followed by MMA candidate Akram Khan Durrani with 1,06,820 votes. NA-36: MMA’s Mohammad Anwar Khan wins NA-36 Lakki Marwat with 43,926 votes against PTI’s Ashfaq Ahmed Khan, who received 34,153 votes. NA-37: MMA’s Asad Mehmood wins NA-37 Tank 3 with 27,871 votes. He is followed by PTI’s Habib Ullah Khan Kundi who bagged 15,971 votes. NA-38: PTI’s Ali Amin Gandapur wins NA-38 DI Khan 1 with 80236 votes. MMA’s Maulana Fazl-ur-Rehman comes in second with 45,457 votes. NA-39: PTI’s Muhammad Yaqoob Sheikh wins NA-39 Dera Ismail Khan 2 with 79,150 votes. He has defeated MMA’s Maulana Fazl-ur-Rehman who got 51,920 votes. NA-40: PTI’s Gul Dad Khan secures victory in NA-40 Bajaur Agency 1 with 34,434 votes, followed by independent candidate Sardar Khan with 17,836 votes. NA-41: In the Tribal Area II, PTI’s Gul Zafar Khan got 22,730 votes. Runner-up was Independent candidate Abdul Majeed with 14,792 votes. NA-42: PTI’s Sajid Khan wins NA-42 Mohmand Agency Tribal Area 3 with 22,717 votes whereas Bilal Rehman, an independent candidate, is at second place with 21,078 votes. NA-43: PTI’s Noorul Haq Qadri wins in NA-43 Khyber Agency 1 with 32,000 votes. Independent candidate Shahji Gul Afridi is runner-up in the constituency with 25,000 votes. NA-44: PTI’s Mohammad Iqbal won with 12,537 votes. Independent candidate Hameed Ullah Jaan Afridi secured 9,042 votes. NA-45: MMA’s Munir Khan Orakzai won with 16,363 votes. The runner-up Independent candidate Malak Rashid Ahmed Khan secured 6,653 votes. NA-46: PPP’s Sajid Hussain Turi has emerged victorious with 21,461 votes. The runner-up PTI’s Syed Iqbal Mian has secured 16,934 votes. NA-47: PTI’s Jawad Hussain emerged as a winner with 11,102 votes. The runner-up is MMA’s Qasim Gul with 6,898 votes. NA-49: MMA’s Jamal Uddin won in the South Waziristan Agency 1 Tribal Area 10 area with 7,794 votes. The second one in the race is PTI’s Dost Muhammad Khan with 6,606 votes. NA-50: Independent Muhammad Ali wins with 23,830 votes. Independent Syed Tariq Gilani follows with 8,250 votes. NA-51: MMA’s Abdul Shakoor won the NA-51 elections with 20,065 votes. He was followed by PTI’s Qaisar Jamal with 18, 335 votes. NA-52: PTI’s Khurram Shehzad Nawaz won the election in NA-52 Islamabad-1 by bagging 64,690 votes. He was trailed by PML-N candidate Tariq Fazl Chaudhry, who secured 34,072 votes. NA-53: PTI Chairman Imran Khan wins Islamabad 2 with 92,891 votes while former PM and PML-N leader Shahid Khaqan Abbasi runner-up with 44,314 votes. NA-54: PTI’s Asad Umar wins NA-54 Islamabad 1 with 56,945 votes. He secured victory over PML-N’s Anjum Aqeel Khan who got 32,991 votes. NA-55: PTI’s Tahir Sadiq won with 1,45,168 votes. He is followed with PML-N’s Sheikh Aftab Ahmed with 1,01,776 votes. NA-56: PTI’s Tahir Sadiq won with 1,63,326 votes. He is followed with PML-N’s Malik Sohail Khan with 18,876 votes. NA-57: PTI’s Sadaqat Ali Abbasi wins NA-57 Murree with 97,104 votes. PML-N’s Shahid Khaqan Abbasi is runner-up with 99,404 votes. NA-58: PPP’s Raja Pervaiz Ashraf wins NA-58 Rawalpindi 2 with 125,090 votes. PTI’s Chaudhry Mohammad Azeem comes in second with 96,574 votes. NA-59: PTI’s Ghulam Sarwar Khan emerged as the winner with 89,055 votes, followed by Independent candidate Chaudhry Nisar Ali Khan with 66,369 votes. NA-61: PTI’s Aamir Mehmood Kiani wins from Rawalpindi-V with 105,000 votes. He was trailed by PML-N’s Ibrar Ahmed with 60,125 votes. NA-62: AML’s Sheikh Rasheed emerged victorious with 1,17,719 votes. PML-N’s Danyal Chaudhry secured 91,312 votes. NA-63: PTI’s Ghulam Sarwar Khan wins Rawalpindi 7 (Taxila) with 64,301 votes as the former PML-N leader and independent candidate Chaudhry Nisar stands at second place with 48,497 votes. NA-64: PTI’s Zulfiqar Ali Khan wins NA-64 Chakwal 1 with 155,214 votes. PML-N’s Major Tahir Iqbal at second place with 13,051 votes. NA-65: PML-Q’s Chaudhry Pervaiz Elahi won with 1,57,492 votes. Following him closely is PML-N’s Muhammad Faez Tamman with 1,06,081 votes. NA-66: PTI’s Chaudhry Farrukh Altaf wins Jhelum 1 with 112,356 votes. PML-N’s Chaudhry Nadeem Khadim second with 92,912 votes. NA-67: PTI’s Fawad Ahmed Chaudhry won with 93,380 votes. PML-N’s Raja Matloob Mehdi secured second place with 82,731 votes. NA-68: PML-Q’s Chaudhary Hussain Elahi wins NA-68 Gujrat 1 with 74,680 votes. PML-N’s Nawabzada Ali Gul at second place with 34,820 votes. NA-69: PML-Q’s Chaudhry Pervaiz Elahi stood first with 122,336 votes while PML-N’s Chaudhry Mubashir Hussain came second with 49,295 in NA-69, Gujrat-II. NA-70: PTI’s Syed Faiz Ul Hassan won with 95,168 votes. He is followed by PML-N’s Chaudhry Jaffar Iqbal with 67,233 votes. NA-71: PTI’s Mohammad Ilyas Chaudhry has won the polls in NA-71 Gujrat-4 bagging 87,181 votes. PML-N’s Chaudhry Abid Raza Kotla stood runner-up with 79,946 votes. NA-72: PML-N’s Chaudhry Armaghan Subhani Subhani wins NA-72, Sialkot with 129,041 votes. PTI’s Firdous Ashiq Awan runner-up with 91,393 votes. NA-73: PML-N’s Khawaja Asif has won with 116,957 votes. PTI’s Muhammad Usman bagged 115,464 votes. NA-74: PML-N’s Ali Zahid wins with 97,237 votes. PTI’s Ghulam Abbas follows with 93,434 votes. NA-75: PML-N’s Syed Iftikharul Hassan won with 101,617 votes. PTI’s Ali Asjad Malhi was on second with 61,432 votes. NA-76: PML-N’s Rana Shamim Ahmed Khan won with 1,33,664 votes, whereas PTI’s Muhammad Aslam secured 93,190 votes. NA-77: PML-N’s Mehnaz Aziz wins NA-77 Narowal 1 with 111,216 votes whereas Independent candidate Mian Tariq Anis is runner-up with 61,918 votes. NA-78: PML-N’s Ahsan Iqbal wins NA-78 Narowal 2 with 159,651 votes. PTI’s Abrar-ul-Haq trails with 88,250 votes. NA-79: PTI’s Muhammad Ahmed Chattha won with 118,709 votes, whereas, TLP’s Muhammad Fayyaz got 12,872 votes. NA-80: PML-N’s Chaudhry Mehmood Bashir Virk emerged victorious with 1,08,653 votes. PTI’s Tariq Mehmood secured 71,937 votes. NA-81: PML-N’s Khurram Dastagir Khan emerges as a winner with 130,837 votes. Runner-up was PTI’s Chaudhry Muhammad Siddique with 88,166 votes. NA-82: PML-N’s Usman Ibrahim wins NA-82, Gujranwala 4 with 117,520 votes. PTI’s Ali Ashraf runner-up with 67,400 votes. NA-83: PML-N’s Zulfiqar Ahmad won the elections with 1,01,852 votes, while PTI’s Rana Nazir Ahmad Khan came second with 46,832 votes. NA-84: In the Gujranwala VI constituency, PML-N’s Azhar Qayyum Nahra won with 119,612 votes, whereas PTI’s Chaudhry Bilal Ejaz got 89,728 votes. NA-85: PTI’s Haji Imtiaz Ahmed Chaudhry won with 99,996 votes. This was trailed by PML-N’s Mushahid Raza with 80,387 votes. NA-86: PML-N’s Nasir Iqbal Bosal won the Mandi Bahauddin-II elections with 147,105 votes. This was trailed PTI’s Nazar Muhammad Gondal with 80,637 votes. NA-87: PTI’s Chaudhary Shaukat Ali Bhatti won with 1,65,618 votes, followed by PML-N’s Saira Afzal Tarar with 1,57,453 votes. NA-88: PML-N’s Muktar Ahmad Bharat won with 81,566 votes, followed by PTI’s Nadeem Afzal Gondal at second place with 71,500 votes. NA-89: PML-N’s Mohsin Shahnawaz wins NA-89 Sargodha 2 with 114,245 votes. PTI’s Usama Ghias Mela is runner-up with 113,422 votes. NA-90: PTI’s Dr Nadia Aziz emerged victorious with 8,52,200 votes. She is followed by PML-N’s Chaudhry Hamid Hameed with 93,948 votes. NA-91: PTI’s Amir Sultan Cheema won with 9,484 votes, whereas, PML-N’s Dr Zulfiqar Ali Bhatti secured 9,403 votes. NA-93: PTI’s Malik Umer Aslam Awan wins NA-93 Khushab 1 with 100,448 votes. PML-N’s Sumaira Malik is runner-up with 70,401 votes. NA-94: PTI’s Malik Mohammad Ehsan Ullah Tiwana won with 90,123 votes. He is followed by PML-N’s Malik Shakir Bashir Awan with 74,505 votes. NA-95: PTI’s Imran Khan wins NA-95 Mianwali 1 with 162,499 votes. PML-N’s Obaidullah Shadikhel is runner-up with 49,505 votes. NA-96: PTI’s Amjad Ali Khan secures victory in NA-96 Mianwali 2 with 156,065 votes, followed by PML-N’s Muhammad Humair Hayat Khan Niazi who gathered 54,179 votes. NA-97: Independent candidate Muhammad Sanaullah Khan Masti emerged victorious with 78,712 votes. PML-N’s Abdul Majeed Khan came second with 61,640 votes. NA-98: PTI’s Mohammad Afzal Khan wins NA-98 Bhakkar 2 with 136,238 votes whereas Independent candidate Rasheed Akbar Khan at second place with 132,445 votes. NA-99: PTI’s Ghulam Muhammad wins NA-99 Chiniot 1 with 81,987 votes. Independent candidate Ghulam Abbas is in second place with 64,112 votes. NA-100: PML-N’s Qaiser Ahmad Sheikh wins NA-100 Chiniot 2 with 76,149 votes. PTI’s Zulfiqar Ali Shah runner-up with 75,827 votes. NA-101: Independent candidate Chaudhary Muhammad Asim Nazeer won with 1,47,812 votes. PTI’s Zafar Sahi came second with 86,575 votes. NA-102: PTI’s Nawab Sher Waseer wins in NA-102, Faisalabad 2 with 109,708 votes. PML-N’s Tallal Chaudhry runner-up with 97,869 votes. NA-104: PML-N’s Muhammad Shahbaz Babar won with 95,099 votes. He is followed by PTI’s Dildar Ahmad Cheema with 73,320 votes. NA-105: PTI’s Raza Nasrullah wins with 77, 862 votes. Independent Muhammad Masood Nasir follows with 69,211 votes. NA-106: Rana Sanaullah wins NA-106 Faisalabad 6 with 106,319 votes. He has beaten PTI’s Nisar Ahmad Jutt who received 103,779 votes. NA-107: PTI’s Khurram Shehzad wins with 126,441 votes. PML-N’s Haji Muhammad Akram Ansari follows with 102,159 votes. NA-108: PTI’s Farrukh Habib wins NA-108 FSB 8 with 112,740 votes. PML-N’s Abid Sher Ali is runner up with 111,529 votes. NA-109: PTI’s Faizullah Kamoka won with 1,22,905 votes. PML-N’s Mian Abdul Mannan came second with 94,476 votes. NA-110: PTI’s Raja Riaz Ahmed wins with 114,215 votes. PML-N’s Rana Muhammad Afzal Khan follows with 108,172 votes. NA-111: PML-N’s Khalid Javaid Warraich wins NA-111 Toba Tek Singh 1 with 110,556 votes, beating PTI’s Osama Hamza (85,448 votes). NA-112: PML-N’s Muhammad Junaid Anwar Chaudhry wins NA-112 Toba Tek Singh 2 with 125,303 votes, trailed by PTI’s Muhammad Ashfaq with 121,031 votes. NA-113: PTI’s Riaz Fatyana won with 1,28,274 votes. PML-N’s Chaudhry Asad ur Rehman came second with 1,06,018 votes. NA-114: PTI’s candidate M Mehboob Sultan with 106,043 votes while PPP’s Makhdoom Syed Faisal Saleh Hayat received 105,454 votes in NA-114, Jhang-I. NA-115: PTI’s Ghulam Bibi Bharwana wins NA-115 Jhang with 91,434 votes. Independent candidate Muhammad Ahmad Ludhianvi is runner-up with 68,616 votes. NA-116: PTI’s Muhammad Ameer Sultan won with 61,321 votes, whereas Independent candidate Muhammad Asif Muavia came second with 52,387 votes. NA-117: PML-N’s Muhammad Barjees Tahir won with 71,891 votes. He is followed by Independent candidate Tariq Mehmood Bajwa with 68,995 votes. NA-118: PTI’s Ijaz Ahmed Shah emerged as a winner in the Nankana Sahib II elections with 63,818 votes. PML-N’s Shezra Mansab Ali Khan Kharal got 61,413 votes. NA-119: PTI’s Rahat Amanullah won NA-119 Sheikhupura-1 polls securing 126,025 votes. He was trailed by PML-N’s Rana Afzaal Hussain, who attained 103,572 votes. NA-120: PML-N’s Rana Tanvir Hussain wins Sheikhupura 2 with 99,674 votes. PTI’s Ali Asghar Chaudhry is the runner-up with 74, 165 votes. NA-121: PML-N’s Javed Latif emerged as a winner with 1,01,622 votes. He is followed by PTI’s Muhammad Saeed Virk with 71,308 votes. NA-122: PML-N’s Muhammad Arfan Dogar won with 96,000 votes. PTI’s Ali Salman came second with 64,619 votes. NA-123: PML-N’s Muhammad Riaz won with 97,193 votes, whereas runner-up was PTI’s Meher Wajid Azeem got 72,535 votes. NA-124: PML-N’s Hamza Shehbaz won the election in NA-124 Lahore-2 by bagging 139,443 votes. He was followed by PTI candidate Nauman Qaisar, who secured 69,251 votes. NA-125: PML-N’s Waheed Alam Khan wins NA-125 Lahore 3 with 122,327 votes, defeating PTI’s Dr Yasmin Rashid who received 105,857 votes. NA-126: PTI’s Muhammad Hammad Azhar emerged as a winner with 105,734 votes, while PML-N’s Mehr Ishtiaq Ahmad Anwar bagged 102,677 votes. NA-127: PML-N’s Ali Pervaiz won with 91,197 votes. PTI’s Jamshed Iqbal Cheema came second with 54,936 votes. NA-128: PML-N’s Shaikh Rohale Asghar wins NA-128 Lahore 6 with 98,199 votes. PTI’s Ijaz Ahmed Dayal is runner-up with 52,774 votes. NA-129: PML-N’s Ayaz Sadiq wins NA-129 Lahore 7 with 103,021 votes. PTI’s Aleem Khan is runner-up with 94,879 votes. NA-130: From the Lahore VIII constituency, PTI’s Shafqat Mahmood bagged 127,405 votes whereas runner-up PML-N’s Khawaja Ahmad Hasan got 104,625 votes. NA-131: PTI Chairman Imran Khan won the polls in NA-131 Lahore with 84,313 votes. Khan is trailed by PML-N heavyweight Khawaja Saad Rafique with 83,633 votes. NA-132: PML-N President Shehbaz Sharif wins in NA-132 Lahore with 95,834 votes. PTI’s Muhammad Mansha Sindhu is the runner-up with 49,093 votes. NA-133: PML-N’s Mohammad Pervaiz Malik emerged as the winner with 89,678 votes, followed by PTI’s Ejaz Ahmad Chaudhry with 77,231 votes. NA-134: PML-N’s Rana Mubashir Iqbal won with 25,022 votes. PTI’s Malik Zaheer Abbas came second with 15,112 votes. NA-135: PTI’s Malik Karamat Ali Khokar won the Lahore XIII elections with 64, 765 votes. PML-N’s Saiful Malook Khokar came second with 55,431 votes. NA-136: PML-N’s Malik Muhamad Afzal Khokhar wins NA-136 Lahore 14 with 88,831 votes. PTI’s Malik Asad Ali Khokhar is runner-up with 44,669 votes. NA-137: PML-N’s Saad Wasim Akhtar won the polls in NA-137 Kasur-1 by securing 38,077 votes. Akhtar was followed by PTI candidate Sardar Asif Ahmed Ali, who could only secure 11,359 votes. NA-138: PML-N’s Rasheed Ahmad Khan wins NA-138 Kasur 2 with 87,510 votes. PTI’s Sardar Rashid Tufail comes in second place with 49,947 votes. NA-139: PML-N’s Rana Muhammad Ishaq Khan won with 65,331 votes. PTI’s Azeem ud din Zahid came second with 62,129 votes. NA-140: PTI’s Sardar Talib Hassan Nakai won with 66,023 votes. PML-N’s Rana Mohammad Hayat Khan secured 64,060 votes. NA-141: PML-N’s Nadeem Abbas Rabera won with 62,318 votes. PTI’s Syed Samsan Shah Bukhari came second with 36,211 votes. NA-142: PML-N’s Chaudhry Riazul Haq wins NA-142 Okara 2 with 140,733 votes. PTI’s Rao Hassan Sikandar is at second place with 76,592 votes. NA-143: PML-N’s Rao Muhammad Ajmal Khan wins with 142,988 votes. PTI’s Syed Gulzar Sibtain follows with 89,177 votes. NA-144: PML-N’s Moin Khan Watto won with 61,467 votes. Independent candidate Manzoor Ahmad Khan Watto secured 50,246 votes. NA-145: PML-N’s Ahmed Raza Khan won with 1,18,581 votes, followed by PTI’s Muhammad Shah Khagga with 90,633 votes. NA-146: PML-N’s Rana Irdat Khan won with 1,38,789 votes, followed by PTI’s Muhammad Amjad Joiya with 1,01,509 votes. NA-147: PML-N’s Syed Imran Khan won with 1,20,697 votes. PTI’s Chaudhry Naveer Shakoor secured 86,462 votes. NA-148: PML-N candidate Chaudhry Muhammad Ashraf won with 125,000 votes while PTI’s Malik Muhammad Yar Dhakoo tailed behind with 67,557 votes in NA-148, Sahiwal-II. NA-149: PTI’s Murtaza Iqbal won with 1,37,632 votes. PML-N’s Muhammad Tufail secured 1,11,999 votes. NA-150: Independent candidate Syed Fakhar Imam won polls in NA-150 Khanewal-1 by securing 82,595 votes. PTI’s Mohammad Raza Hayat Hiraj stood runner-up with 71,034 votes. NA-151: PML-N’s Mohammad Khan Daha wins Khanewal 2 with 111,198 votes. PTI’s Ahmad Yar Hiraj on second place with 109,520 votes. NA-152: PTI’s Zahoor Hussain Qureshi emerges victorious with 1,08,707 votes. The runner-up PML-Q’s Pir M Aslam Bodla Siddiqui bagged 98,938 votes. NA-153: In the Khanewal IV constituency PML-N’s Chaudhry Iftikhar Nazir won with 106,291 votes. Nazir was followed by PTI’s Malik Ghulam Murtaza 76,920 votes. NA-154: PTI’s Ahmed Hussain Dehr won with 74,220 votes. PPP’s Syed Abdul Qadir Gilani secured 64,257 votes. NA-155: PTI’s Amir Dogar has won the election in NA-155 Multan-2 by attaining 88,567 votes, unofficial and unconfirmed results from all polling stations suggested. PML-N candidate Sheikh Mohammad Tariq Rasheed stood runner-up with 71,457 votes. NA-156: PTI’s Shah Mehmood Qureshi wins polls in NA-156 Multan-3 by securing 93,500 votes, unofficial and unconfirmed results from all polling station suggested. PML-N’s Amir Saeed Ansari stood runner-up with 74,624 votes to his credit. NA-157: PTI’s Zain Qureshi wins NA-157 Multan 4 with 77,371 votes while PPP’s Syed Ali Musa Gilani at second place with 70,830 votes. NA-158: PTI’s Muhammad Ibrahim Khan wins NA-158 Multan 5 with 83,304 votes, defeating former PM and PPP leader Yousuf Raza Gilani who received 74,443 votes. NA-159: PTI’s Rana Muhammad Qasim Noon wins NA-159 Multan 6 with 102,606 votes. PML-N’s Muhammad Zulqarnain Bukhari is runner-up with 99,374 votes. NA-160: PML-N’s Abdul Rehman Kanju won with 1,25,740 votes, whereas PTI’s Muhammad Akhtar Kanju came second with 1,15,321 votes. NA-161: PTI’s Mian Muhammad Shafiq wins NA-161 Lodhran 2 with 121,638 votes. PML-N’s Mohammad Siddique Baloch received 116,093 votes at stands at second place. NA-162: PML-N’s Faqir Ahmad won with 8,10,956 votes, followed by Independent candidate Nazir Jatt secured 64,766 votes. NA-163: PML-N’s Syed Sajid Mehdi won with 70,325 votes. He is followed by PTI’s Ishaq Khan with 56,873 votes. NA-164: PTI’s Tahir Iqbal wins at Vehari III with 82,034 votes. PML-N’s Begum Tehmina Doultana received 68,198 votes and stands at second place. NA-165: PTI’s Aurangzeb Khan Kichi won with 99,287 votes, whereas PML-N’s Saeed Ahmed Khan Manais came second with 65,536 votes. NA-166: Winner was Independent candidate Abdul Ghaffar Wattoo with 1,01,811 votes, followed by PTI’s Syed Muhammad Asghar with 93,020 votes. NA-167: PML-N’s Alam Dad won with 91,349 votes. Runner-up PTI’s Mian Mumtaz with 49,526 votes. NA-168: PML-N’s Ehsan ul Haq Bajwa won with 1,24,218 votes. The runner-up was PTI’s Fatima Tahir Cheema with 74,517 votes. NA-169: PML-N’s Noor ul Hassan won with 92, 285 votes. He is followed by PML-Zia’s Ijaz ul Haq with 71,677 votes. NA-170: PTI’s Muhammad Farooq Azam Malik won with 84,495. PML-N’s Muhammad Balighur Rehman got 74,694 and is it at second place. NA-171: PML-N’s Riaz Hussain Pirzada won the election in NA-171 Bahawalpur-2 with 99,202 votes. He was followed by PTI’s Naeemuddin Waraich, who secured 88,297 votes. NA-172: PML-Q’s Tariq Bashir Cheema won with 1,06,383 votes. He is followed by PML-N’s Saud Majeed with 1,01,971 votes. NA-173: PML-N’s Mian Najeeb Ud Din won in Bahawalpur IV constituency with 86,142 votes. Runner-up PTI’s Khadeeja Aamir bagged 60,211 votes. NA-174: PTI’s Makhdoom Syed Sami-ul-Hassan Gillani wins NA-174 Bahawalpur 5 with 63,884 votes. He is followed by independent candidate Prince Bahawal Abbas who gathered 58,092 votes. NA-175: PTI’s Syed Mobeen won with 96,004 votes. He is followed by PPP’s Khawaja Ghulam Rasool with 88,706 votes. NA-176: PML-N’s Sheikh Fayyazuddin won by 78,536 votes. Independent candidate Hafiz Muhammad Tahir Zeeshan came second. NA-177: PTI’s Makhdoom Khusro Bukhtyar won the Rahim Yar Khan III elections with 100,768 votes. Runner-up was PPPP’s Makhdoom Shahabuddin with 64,645 votes. NA-178: From Rahim Yar Khan-IV constituency PPP’s Syed Mustafa Mahmud won with 93,044 votes and runner-up was PML-N’s Muhammad Tariq with 50,723 votes. NA-179: PTI’s Javed Iqbal won with 1,10,827 votes, whereas, PML-N’s Mian Imtiaz Ahmed bagged 88,795 votes. NA-180: PPPP’s Syed Murtaza Mahmud won by 71,988 votes, followed byPML-N’s Arshad Khan Leghari with 54,990 votes. NA-181: Independent candidate Muhammad Shabbir Qureshi won with 64,012 votes. He is followed by another independent candidate Sultan Mehmood with 54,191 votes. NA-182: PPP’s Mehar Irshad Ahmed wins NA-182, Muzaffargarh 2 with 53,726 votes. ARP’s Jamshed Dasti runner-up with 50,400 votes. NA-183: PPP’s Raza Rabbani Khar won with 54,922 votes. Independent candidate Fiaz Hassan got 48,691 votes. NA-184: PPP’s Nawabzada Iftikhar Ahmed Khan won with 54,778 votes. ARP’s Jamshed Ahmed got 36,332 votes. NA-185: Independent Syed Basit wins with 94,282 votes. PTI’s Muhammad Muazzam Ali Jatoi follows with 72,822 votes. NA-186: Winner was PTI’s Aamir Talal Khan with 62,915 votes, followed by PPPP’s Muhammad Dawood Khan with 52,790 votes. NA-187: PTI’s Abdul Majeed Khan Niazi wins with 93,902 votes. Independent Bahadur Ahmed Khan runner-up with 82,225 votes. NA-188: PTI’s Niaz Ahmed Jhakkar wins NA-188 Layyah 2 with 109,420 votes whereas PML-N’s Mohammad Saqlain Bukhari stands at second place with 102,943 votes. NA-189: PTI’S Sheraz Mahmood won with 78,596 votes in NA-189 DG Khan polls. Independent candidate Mir Badshah is at second place with 39,522 votes. NA-190: Independent candidate Amjad Farooq Khosa emerged victorious, while PTI’s Zulfikar Ali Khosa secured second place in NA-190 Dera Ghazi Khan-2 polls. NA-191: PTI’s Zartaj Gul won with 79,817 votes, whereas runner-up PML-N’s Sardar Awais Leghari got 54,548 votes. NA-192: PTI’s Sardar Muhammad Khan Laghari won with 80,522 votes. He was trailed by runner-up Shehbaz Sharif with 67,608 votes. NA-193: PTI’s Jaffer Khan Leghari has won the polls in NA-193 Rajanpur-1 with 87,915 votes, unofficial and unconfirmed results from all polling stations suggested. Leghari was followed by PML-N’s Sardar Sher Ali Khan Gurchani, who could secure 55,409 votes. NA-194: PTI’s Nasrullah Dareshak won the NA-194 Rajanpur-2 election by securing 75,209 votes. Dareshak was followed by independent Hafeezur Rehman Khan Dareshak, who attained 60,311 votes. NA-195: PTI’s Sardar Riaz Mehmood Khan wins with 53,724 votes. PML-N Khizar Hussain Mazari runner-up with 42,426 votes. NA-196: PTI’s Muhammad Mian Soomro won with 92,274 votes. NA-197: PPPP’s Ehsanur Rehman Mazari wins with 84,742 votes. MMA’s Shamsheer Ali Mazari follows with 47,326 votes. NA-198: PPP’s Abid Hussain Bhayo won with 61,213 votes. The runner-up independent candidate Muhammad Ibrahim Jatoi bagged 49,961 votes. NA-199: GDA’s Ghous Bux Khan Mahar won with 62,785 votes. Runner-up was PPPP’s Zulfiqar Ali Kamario with 55,987 votes. NA-200: PPP Chairman Bilawal Bhutto Zardari leads NA-200 Larkana polls with 84,426 votes. Bilawal is followed by MMA’s Rashid Soomro, who has so far managed to gain 50,200 votes. NA-201: PPP’s Khursheed Ahmed Junejo wins with 97,051 votes. GDA’s Allah Bux Unar runner-up with 69,111 votes. NA-202: PPP’s Aftab Shahban Mirani wins with 72,159 votes. MMA’s Nasir Mehmood Soomro follows with 36,046 votes. NA-203: PPP’s Mir Amer Ali Khan Magsi won with 80,026 votes. NA-204: PPP’s Khalid Ahmed Khan won with 99,878 votes. NA-205: Independent candidate Ali Mohammad Mahar wins NA-205 Ghotki 2 with 71,943 votes. PPP’s Ahsanullah stands at second place with 41,843 votes. NA-207: PPP’s Nauman Islam Shaikh won with 69,379 votes. NA-208: PPP’s Nafisa Shah wins NA-208 Khairpur 1 with 107,847 votes, trailed by GDA’s Ghous Ali Shah with 57,477 votes. NA-209: PPP’s Pir Syed Fazal Ali Shah won with 95,921 votes while GDA’s Pir Syed Sadaruddin Shah Rashdi came second with 76,046 votes in NA-209, Khairpur-II. NA-210: PPPP’s Syed Javed Jilani wins with 90,718 votes. GDA’s Syed Kazim Ali Shah runner-up with 78,525 votes. NA-211: PPP’s Syed Abrar Ali Shah 1,10,914 votes. NA-212: PPP’s Zulfikar Ali wins NA-212, Naushero Feroz with 90,364 votes. GDA’s Ghulam Murtaza Jatoi runner-up with 80,174 votes. NA-213: PPP’s Asif Ali Zardari wins NA-213, Shaheed Benazirabad 1 with 111,179 votes. GDA’s Sardar Shair Muhammad Rind runner-up with 53,521 votes. NA-214: PPPP’s Ghulam Mustafa Shah wins with 110,902 votes. SUP’s Syed Zainul Abideen follows with 54,676 votes. NA-215: PPP’s Naveed Dero wins NA-215, Sanghar 1 with 77,812 votes. GDA’s Haji Khudabaksh runner-up with 77,227 votes. NA-216: PPP’s Shazia Marri wins from NA-216 Sanghar 2 with 82,667 votes. The Grand Democratic Alliance’s Kashan Chand is runner-up with 70,135 votes. NA-217: PPPP’s Roshanuddin Junejo wins with 102,361 votes. GDA’s Mehar Ali Khan runner-up with 43,757 votes. NA-218: Independent candidate Ali Nawaz Shah won with 75,795 votes. NA-219: PPPP’s Mir Munwar Ali Talpur wins with 105,823 votes. GDA’s Arbab Ghulam Rahim follows with 51,145 votes. NA-220: PPP’s Nawab Yousaf Talpur won with 1,62,979 votes. The runner-up PTI’s Shah Mehmood Qureshi bagged 1,04,267 votes. NA-221: PPP’s Pir Noor Muhammad Shah wins with 75,360 votes. PTI’s Shah Mehmood Qureshi is the runner-up with 57,125 votes. NA-222: PPP’s Mahesh Malani won the elections with 1,06,630 votes, followed by GDA’s Arbab Zakaullah at 87,291 votes. NA-223: PPP’s Syed Abrar Ali wins NA-223 Matiari with 92,500 votes. GDA’s Zafar Ali Shah trails with 59,870 votes. NA-224: PPP’s Zulfiqar Bachani emerged victorious in NA-224 Tando Allahyar election after he attained 80,230 votes. GDA’s Mohammad Mohsin stood runner-up with 51,536 votes. NA-225: PPP’s Syed Hussain Tariq wins NA-225 Hyderabad 1 with 81,983 votes. PTI’s Khawand Bakhsh comes in second with 50,968 votes. NA-226: MQM’s Sabir Kaimkhani wins with 46,646 votes. PTI’s Jamshed Ali Sheikh follows with 38,672 votes. NA-227: MQM-P’s Salahuddin wins with 52,053 votes. PTI’s Muhammad Hakam follows with 41,513 votes. NA-228: PPP’s Naveed Qamar wins NA-228 Tando Mohammad Khan polls with 76,067 votes, trailed by GDA’s Mir Ali Nawaz Talpur with 45,159 votes. NA-229: PPP’s Mir Ghulam Ali Talpur won with 96,977 votes. NA-230: GDA’s Fehmida Mirza won with 96,875 votes. NA-231: PPP’s Syed Ayaz Ali Shah Sherazi won in the NA-231 election with 129,980 votes, whereas MMAP’s Molvi Muhammad Saleh Alahdad got 11,177 votes. NA-232: PPPP’s Shams un Nisa won with 152,691 votes. Whereas, PTI’s Arslan Bux Brohi came second with 18,900 votes. NA-233: PPP’s Sikandar Ali won with 1,33,492 votes. NA-234: PPP’s Irfan Ali Leghari won with 96,038 votes. NA-235: PPP’s Rafiq Ahmed Jamali wins with 81,200 votes. PTI’s Karim Ali Jatioi follows with 63,008 votes. NA-236: PPP’s Jam Abdul Karim Bijar won with 66,623 votes and PTI’s Masroor Ali is on the second place with 26,456 votes. NA-237: PTI’s Jamil Ahmed Khan wins with 33,289 votes. PPPP’s Abdul Hakim Baloch follows with 31,907 votes. NA-238: PPP’s Syed Rafiullah has won with 29,598 votes. The runner-up PRHP’s Hafiz Aurangzeb bagged 19,453 votes. NA-239: PTI’s Muhammad Akram won with 69,147 votes. NA-240: MQM-P’s Iqbal Muhammad Ali Khan won with 61,165 votes. NA-241: PTI’s Faheem Khan wins NA-241, Karachi Korangi 3 with 26,706 votes. MQM’s Moin Aamer Pirzada runner-up with 23,873 votes. NA-242: PTI’s Saif Ur Rehman won with 27,333 votes. NA-243: PTI chief Imran Khan wins with 91,358 votes. MQM’s Syed Ali Raza Abidi follows with 24,082 votes. NA-244: PTI’s Ali Haider Zaidi wins with 69,475 votes. PML-N’s Miftah Ismail follows with 31,247 votes. NA-245: PTI’s Aamir Liaquat Hussain won with 56,615 votes. The runner-up is MQM’s Muhammad Farooq Sattar with 35,247 votes. NA-246: PTI’s Abdul Shakoor Shad wins with 52,750 votes, beating TLP’s Ahmed who secured 42,345 votes. Bilawal Bhutto was at third with 39,325 votes. NA-247: PTI’s Arif Alvi wins in NA-247 Karachi with 91,020 votes. MQM-Pakistan’s Farooq Sattar runner-up with 24,146 votes. NA-249: PTI’s Muhammad Faisal Vawda won with 35,344 votes. NA-250: PTI’s Ataullah wins with 30,052 votes. MQM’s Fayyaz Kaimkhani follows with 24,066 votes. NA-251: MQM-P’s Syed Amin ul Haque won with 56,888 votes. NA-252: PTI’s Aftab Jehangir wins with 21,065 votes. MQM’s Abdul Qadir Khanzada runner-up with 17,858 votes. NA-253: MQM’s Usama Qadri wins with 52,426 votes. PTI’s Ashraf Jabbar follows with 49,145 votes. NA-254: PTI’s Muhammad Aslam wins in Azizabad with 72,070 votes. MQM-P Sheikh Salahuddin is runner-up with 48,813 votes. NA-255: MQM-P’s Dr Khalid Maqbool Siddiqui came first with 59,807 votes in NA-255 central-III. PTI candidate Mehmood Baqi Moulvi stood second with 50,352 votes. NA-256: PTI’s Muhammad Najeeb Haroon wins NA-256, Karachi Central 4 with 89,850 votes: unofficial results from all polling stations. MQM-P’s Amir Wali Uddin Chishti runner-up with 45,575 votes. NA-257: MMA’s Maulana Abdul Wasay wins NA-257 Killa Saifullah with 30,000 votes, defeating JUI-NP’s Abdul Rauf who bagged 11,580 votes. NA-258: BAP’s Sardar Muhammad Israr Tareen is leading with 3,170 votes, while MMA’s Amir Zaman has bagged 2,822 votes so far. NA-259: Independent candidate Mir Hair Bayar Khan has bagged 1,878 votes, closely followed by Mir Tariq Mehmood with 1,854 votes. NA-260: PTI’s Sardar Yar Muhammad Rind has 29,343 votes, while BAP’s Khalid Hussain Magzi has secured 22,580 votes so far. NA-261: PTI’s Mir Khan Muhammad Jamali has managed to secure 59,334 votes, whereas PPP’s Mir Changez Khan Jamali got 3,757 votes so far. NA-262: MMA’s Kamal Uddin secured 5,780 votes, while PkMAP’s Muhammad Essa Roshan has 4,920 votes. NA-263: MMA’s Salauddin has secured 6,852 votes, whereas PkMAP’s Mehmood Khan Achakzai has 2,914 votes so far. NA-264: Asmatullah has emerged as a winner from NA-264 with 14,887 votes. The runner-up is BNP’s Malik Wali Kakar with 10,071 votes. NA-265: PTI’s Qasim Khan Suri wins with 25,973 votes. BNP’s Nawabzada Mir Lashkari Raisani follows with 20,389 votes. NA-266: BNP’s Agha Hassan Baloch emerged as the winner in the NA-266 constituency with 20,034 votes. The runner-up MMA’s Hafiz Hussain Ahmed secured 11,057 votes. NA-267: MMA’s Agha Syed Mehmood is leading with 21,185 votes, while BNP’s Manzoor Ahmed Khan has secured 19,208 votes so far. NA-268: BNP’s Muhammad Hashim wins with 14,435 votes. MMA’s Muhammad Usman Badini follows with 12,272 votes. NA-269: BNP’s Muhammad Akhtar Mengal is leading with 9,173 votes. Trailing behind is BAP’s Muhammad Khalid Bizenjo with 2,605 votes. NA-270: BNP’s Meer Nazeer Ahmed Baloch is leading with 288 votes, while BNP-A’s Muhammad Hanif has secured 248 votes. NA-271: BNP-A’s Syed Ehsan Shah is leading with 2,320 votes, whereas BAP’s Zubaida Jalal has 1,604 votes. NA-272: Independent candidate Muhammad Aslam Bhotani is leading with 28,504 votes. Next in line is BAP’s Jam Kamal Khan with 28,274 votes. PB-13: PTI’s Umar Khan Jamali has won with 17,250 votes, followed by independent Rahat Faiq Jamali with 15,120 votes. PB-32: BNP’s Naseer Ahmed wins PB-32 Quetta 9 with 6,795 votes, beating MMA’s Abdul Ghafoor Haider who received 4,434 votes to finish second. PS-18: PPP’s Jam Mehtab Hussain Dahar has suffered defeat at the hands of PTI’s Sardar Sheharyar Khan by a margin of 10,000 votes. PS-26: PPP’s Qaim Ali Shah wins PS-26 Khairpur 1 with 48,546 votes. GDA’s Abdul Ghafoor Shaikh is runner-up with 27,974 votes. PS-51: PPP’s Sardar Ali Shah has won with 55,118 votes. GDA’s Jadim Mangriyo got over 27,000 votes. PS-63: PPP’s Sharjeel Memon wins in PS-63, Hyderabad 2 with 44,243 votes. TPP’s Muhammad Ali Kazi emerged as the runner-up. PS-75: PPP’s Shah Hussain Sherazi has won with 27,626 votes. MMA’s Molvi Muhammad Ismail came second with 9,741 votes. PS-78: PPP’s Ali Hasan Zaidi has won with 50,103 votes. The runner-up is PTI’s Zaib Nayazi with 4,460 votes. PS-104: PPP’s Saeed Ghani wins PS-104, Karachi East 6 with 27,615 votes. GDA’s Irfanullah Khan runner up with 11,194 votes. PS-111: PTI’s Imran Ismail wins PS-111 Karachi South 5 with 30,576 votes. He has defeated MMA’s Sufian who got 8,753 votes. PK-11: PPP’s Sahibzada Sanaullah won with 18,900 votes. MMA’s Azam Khan was second with 12,015 votes. PK-23: PTI’s Shaukat Yousufzai has won with 16,571 votes. PML-N’s Muhammad Irshad has 12,219 votes. PK-61: PTI’s Pervez Khattak wins PK-61 Nowshera 1 with 20,647 votes. ANP’s Pervez Ahmed Khan was the runner-up with 16,054 votes. PK-70: PTI’s Shah Farman has won with 15,404 votes while ANP’s Khush Dil bagged 15.357 votes. PK-74: PTI’s Pir Fida Muhammad has won with 19,349 votes, beating ANP’s Muhammad Abrar who bagged 8,260 votes. PK-75: PTI’s Wajidullah Khan has won with 27,659 votes. ANP’s Syed Aqil Shah got 8,464 votes. PK-79: PTI’s Fazal Illahi has won with 18,044 votes. PPP’s Umar Khitab came second with 5,690 votes. PP-12: PTI’s Wasiq Qayyum Abbasi wins PP-12 Rawalpindi 7 with 27,351 votes whereas Independent candidate Chaudhry Nisar at second place with 11,099 votes. PP-14: PTI’s Muhammad Basharat Raja won with 52,247 votes. PML-N’s Usama Tanveer Chaudhry came second with 31,856 votes. PP-110: PTI’s Mian Khayal Ahmed won with 69,441 votes. He was trailed by PML-N’s Malik Nawaz with 58,401 votes. PP-131: PML-N’s Aijaz Hussain Bhatti has won with 37,086 votes. Independent candidate Shazia Cheema came in second with 35,847 votes. PP-147: PML-N’s Mujtaba Shujaur Rehman won with 69,031 votes. PTI’s Tariq Saadat got 30,596 votes. PP-160: PTI’s Mehmood ur Rashid has won with 63,059 votes. PML-N’s Tausif Shah came second with 50,571 votes. PP-161: PML-N’s Faisal Ayub won with 30,987 votes. TLP’s candidate came second with 3,936 votes. PP-168: PML-N’s Khawaja Saad Rafique wins PP-168 Lahore 25 with 34,112 votes, defeating PTI’s Muhammad Fayyaz Bhatti with 14,940 votes. PP-184: Najam Sethi’s wife Jugnu Mohsin has won in each one of the 162 polling stations. Pakistan Muslim League (PML-N) President Shehbaz Sharif questioned the fairness of the polls, claiming that election results in Lahore and other cities were not compiled in a transparent way. Addressing a press conference after the announcement of initial results, he said that changes were made in form 45 across various constituencies. Results of Pervaiz Malik, Khawaja Asif, Ayaz Sadiq were halted, Shehbaz added, stressing that the public mandate was disrespected. The PML-N chief sided with other political parties who alleged the practices of rigging in polling stations. Shehbaz said he will conduct meetings with other leaders of his party, and also consult with other fronts in order “to ensure the supremacy of the public representation as well as the democracy”. Senator Mushahid Hussain declared the 2018 polls as “the most rigged elections in Pakistan’s history”. He reasoned the pre-poll rigging and ‘concealment of results’ during the counting process. The PML-N alleged that officials of the security forces took the polling stations under their control and ousted polling agents of their party in several constituencies. Shehbaz and other PML-N leaders have claimed that they have video evidence of the alleged rigging during the 2018 polls. Pakistan People’s Party (PPP) Chairman Bilawal Bhutto Zardari took to Twitter and stated that election results of constituencies were not delivered to anyone, questioning the transparency of the process. “[PPP] candidates complaining polling agents have been thrown out of polling stations across the country. Inexcusable and outrageous,” he said. In a press conference post results, the PPP leaders noted that certified results were concealed “from Larkana to Karachi and from Punjab to Khyber Pakhtunkhwa”. Senators Raza Rabbani and Sherry Rehman complained that all political parties have been pushed against the wall except one, hinting that the PTI alone had been favoured by the rigging practices. Rabbani commented that pushing the polling agents out of the stations meant that someone was “creating the results”. “All voters were not allowed to express their right to vote,” he added, asking the ECP to take notice of the ‘naked rigging’. The PPP leaders made it clear that if their concerns were not addressed then they hold the right to demonstrate against the elections. Moreover, Senator Taj Haider has sent an urgent complaint to the Chief Election Commissioner about the ‘naked rigging’ in Badin, claiming that the “PPP polling agents were forced out from polling stations by the security forces assigned to ensure free and fair poll”. “The PPP candidates at NA-230 and PS-37 have informed the Central Election Cell of Pakistan Peoples Party that their officially authorised polling agents have been forcibly ejected from all the polling stations by security personnel without assigning any reason. It is also brought on record that the final count of result has not been done yet and was under process. As a result, the whole exercise of vote counting in the subject constituencies has become doubtful and non-transparent,” the PPP election cell wrote to the CEC. Muttahida Majlis-e-Amal (MMA) chief Maulana Fazlur Rehman also rejected the election results, claiming that widescale rigging took place in the polling stations. He said that he talked with Shehbaz Sharif and Asif Ali Zardari over the phone and exchanged the same opinion, calling 2018 elections unfair. The MMA chief announced to call an all parties conference (APC) to discuss the matter. Leaders of PPP, PML-N and MQM-P have questioned the fairness of the polls, asking the ECP to take immediate notice of their polling agents being ousted from the polling stations during the counting of the results. PML-N Spokesperson Marriyum Aurangzeb claimed that her party’s polling agents were not allowed to sit within the polling stations while the polling agents were compiling results. “Changes have been made in form 45 across multiple constituencies in Punjab,” she claimed, adding that her party would not accept such ‘tempered’ results. The MQM-P alleged that its polling agents were “thrown out of the polling stations” during the counting process. PSP leader Raza Haroon, while making the same allegations, claimed that verified copies of the results were not given to the political parties’ agents in all constituencies of Karachi and Hyderabad. “This has never happened before,” he added. Balochistan National Party-Mengal (BNP-M) Akhtar Mengal complained about the alleged rigging in the province. He announced to protest against the “forcibly altered results”. Polling in the General Election 2018 concluded at 6.00pm on Wednesday, as the Election Commission of Pakistan (ECP) rejected requests from major political parties of the country, including the PML-N and Pakistan People’s Party (PPP), to extend the time for an hour. Earlier, the PML-N had sent a letter to the electoral body seeking extension in the polling time by an hour due to “voters standing in long lines in the hot and humid weather”. The PML-N held an emergency meeting over the matter, which was attended by the party’s senior leaders, and requested the ECP to extend the polling time. PPP had also called for an extension in polling time, saying that the voting process across the country is very sluggish due to general mismanagement in the polling stations. Moreover, Pakistan Sarzameen Party’s Mustafa Kamal and Awami Muslim League (AML) chief Sheikh Rasheed also requested the ECP to extend the polling time. Pakistan Tehreek-e-Insaf (PTI) criticised the PML-N’s call for extension in polling time, saying that “even if the polling time is extended by two hours, the N-league supporters won’t come out to cast vote”. Following rain, polling was temporarily halted across some Lahore areas, while at a polling station in NA-29 (Peshawar III) voters and polling staff faced difficulties due to load shedding. Moreover, there were several delays due to clashes between rival party supporters and other irregularities. Earlier in the day, almost 106 million Pakistanis cast their votes to choose their next prime minister and government. The polling began at 8am at 85,307 polling stations across the country, of which 17,007 had been declared “highly sensitive”. As many as 12,570 candidates are contesting elections for a total of 849 seats at national and provincial assemblies in the general polls. 6:00 pm- Polling time ends and the officials of the ECP start counting the results. 5:50 pm- ECP sends notice to Imran Khan. He has been summoned on July 30 for violating ECP’s code of conduct as he cast his vote in front of the media and not in secrecy. 5:14 pm- As polling enters final hour, long queues seen across Karachi NA-248 polling stations. 5:12 pm- ECP rejects PML-N’s request to extend polling time. “Polling time was already extended by one hour,” ECP said. It added that all voters present in the polling station at 6 pm will be allowed to cast their votes but people won’t be allowed to enter queues. 4:50 pm- PTI leader Senator Faisal Javed Khan says the party has no issue if polling deadline extended. Khan claims PML-N is flustered and its voters will still not come out to vote even if the deadline is extended. 4:45 pm- Similarly, PPP leader Farhatullah Babar has also sought an hour’s extension in the polling deadline by ECP due to the ‘slow voting process’. Awami Muslim League chief Sheikh Rasheed pleads CEC to extend polling time for the same reason. 4:40 pm- PML-N holds an emergency press conference, demands an extension in polling time. PML-N leader Mushahid Hussain Sayed during the press conference called for the CEC to direct ECP staff in polling stations across the country to expedite the polling process after reports of a ‘slow voting process’. The PML-N leader also asked the CEC to ensure no voter is denied a right to cast vote, thus everybody present in the queue should be allowed to vote. Moreover, ECP receives 560 complaints from across the country. 4:24 pm- Women reportedly barred from voting at three polling stations in Malakand division. 4:18 pm- Balochistan Home Minister Agha Umar Bangulzai donates blood for Quetta blast victims. 4:15 pm- Cheif Election Commissioner Justice (r) Sardar Raza Khan is chairing a high-level meeting to decide on extending the polling time. He has asked the provincial election commissioner for their opinions. 4:10 pm- Balochistan Governor Mohammad Khan Achakzai casts vote in Gulistan. 4:08 pm- Balochistan Awami Party candidate Nawaz Chengaiz Marri alleges rigging in his constituency, PB-9 stating that more than 400 voters have not been allowed to cast their votes. 3:52 pm- KP Governor Iqbal Zafar Jhagra casts vote in NA-29 Peshawar-III. 3:46 pm- PAT leaders urge workers to vote for PTI in Lahore NA-133 constituency. Furthermore, polling has been halted as of now in Badin PS-74 after PPP, GDA workers clash. 3:40 pm- Four people have been injured in Mahmoodabad area of Chaman after workers of two political parties clashed. 3:36 pm- Presiding officer at NA-187 polling station dies due to cardiac arrest. Meanwhile, Ali Tareen casts vote at Lodhran polling station. 3:35 pm- Awami National Party chief Asfandyar Wali Khan has cast his vote in Charsadda’s NA-24 constituency. 3:33 pm- Sarfraz Ahmed casts vote in Karachi’s NA-256 constituency. 3:30 pm- Five people were injured after workers of two political parties clash in Ghotki’s PS-21 constituency. 3:27 pm- PPP leaders Azizullah Mangi and Siddique Mahesar injured in firing at a polling station in PS-84 Dadu. 3:21 pm – PPP Co-Chairman Asif Ali Zardari casts vote at NA-213 Benazirabad polling station. 3:12 pm- COAS General Qamar Javed Bajwa and his wife cast vote in Rawalpindi. In a message, he said we are united and steadfast to defeat the inimical forces working against Pakistan and urged people to “please come out and vote undeterred”. Cricketer Wasim Akram casts vote at Lahore NA-126 polling station. 3:03 pm- In another exchange fire between two political parties in Khushab’s NA-93 constituency. Whereas, a large number of women cast vote in the NA-49 constituency in South Waziristan. Meanwhile, PTI and PML-N men exchange blows in Pakpattan NA-145/146 constituency. 3:01 pm- Interim Prime Minister Nasirul Mulk casts vote at Swat NA-3 polling station. 2:51 pm- In Sahiwal NA-148 constituency five people were injured as political workers clash. Moreover, polling was halted in various polling stations due to rain in Lahore. 2:41 pm- Polling kicked off after 1 pm at two Karachi NA-241 polling stations. Two men, three women injured in Khairpur NA-209 roof collapse. 2:40 pm – PML-N requests to extend polling time by one hour. Moreover, women in Chakwal vote for the first time since the 1960s. 2:31 pm- Former interior minister Ahsan Iqbal casts vote at Narowal NA-78 polling station. 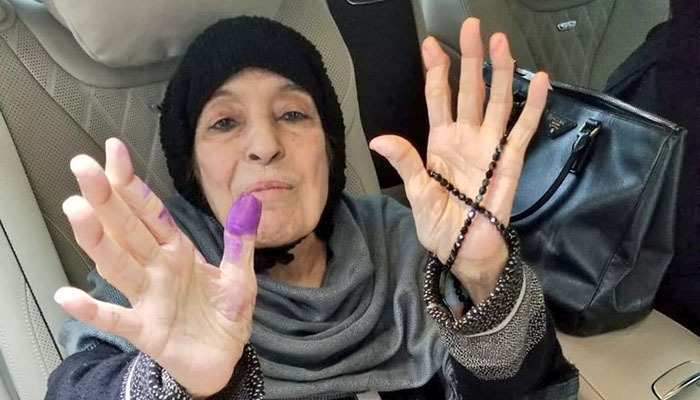 2:25 pm – Shehbaz Sharif, Nawaz Sharif’s mother cast vote at the NA- 124 constituency. 2:17 pm- Load-shedding causing problems for voters at NA-29 (Peshawar III) polling station. 2:13 pm – Despite ECP’s directives, locals reportedly bar women from voting in NA-29. Meanwhile, PPP leader Syed Khursheed Shah casts his vote in Sukkur. 2:02 pm – Former foreign minister Khawaja Asif casts vote at Sialkot NA-73 polling station. Rights activist Jibran Nasir’s claims of TLP men attacking party camps. 1:58 pm – Former foreign minister Hina Rabbani Khari casts vote at Muzaffargarh NA-183 polling station. In addition to that, PTI claims to receive complaints about ‘slow polling’ in Rawalpindi NA-61. 1:57 pm – Zulfi Bukhari casts his vote in Islamabad NA-53 constituency. 1:56 pm – Voting halted at a polling station in NA-5 Upper Dir after rigging allegations by JI polling agent. 1:55 pm – Pakistan cricket team captain Sarfraz Ahmed arrives to cast vote in Karachi’s NA-256 constituency Buffer Zone locality, urges people to come out and vote. 1:52 pm – JI Chief Sirajul Haq cast his vote in Lower Dir NA-7 constituency. 1:40 pm – PML-N leader and former power minister Awais Leghari casts vote in DG Khan’s NA-191 constituency. 1:37 pm – One injured as PTI, ANP workers clash in Charsadda. 1:35 pm – ECP issues orders to facilitate aged, pregnant and differently abled people. Moreover, people in South Waziristan participate in elections after years of conflict. 1:29 pm – Balochistan National Party-Mengal (BNP-M) alleges rigging in a letter to ECP. Party claims polls rigged in favour of Balochistan Awami Party (BAP) PB-47 and NA-271 candidates. 1:24 pm – At least three injured as PPP and GDA workers clash in Matiari. Sherry Rehman urges ECP to take notice of Sindh violence. 1:20 pm – Voters greet, thank military personnel outside polling stations. 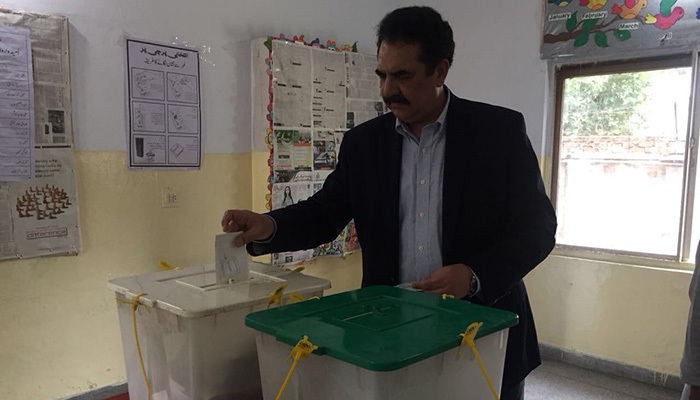 1:10 pm – Former chief of army staff General (r) Raheel Sharif casts his vote in Lahore, his hometown. 1:15 pm – Senate Chairman Sadiq Sanjrani casts vote in Naukundi, Balochistan. Moreover, Chiniot PP-95 independent candidate Fateh Sher Khokhar, five others nabbed for misbehaving with voters. 1:08 pm- Transgenders barred from entering Peshawar polling stations despite possessing valid documents. 1:00 pm – PTI and PML-N workers clash in Hazro Tehsil of Attock. Police called in to control the situation. 12:56 pm- Women in Mohmand proceed to cast their votes. 12:55 pm – Veteran politician Javed Hashmi cast his vote in Multan. 12:50 pm – Media footage aired showing Imran Khan cast his vote in violation of ECP rules. The footage shows Imran stamping the ballot paper in full public view at the presiding officer’s table instead of inside the polling booth in secret. The ECP is yet to issue an official response on the matter. 12:45 pm – Two political parties workers clash in Multan’s NA-155 constituency. 12:42 pm – PTI workers reportedly violate ECP code of conduct, mobile phones used to click pictures of NA-28 and 25 ballot papers. 12:37 pm – ECP takes notice of Bilawal’s post voting speech. 12:30 pm – Pakistan People’s Party (PPP) Chairman Bilawal Bhutto cast his vote in the NA-200 constituency in Larkana. While addressing the media, he condemned the attack in Quetta as well as other incidents of violence that took place in Sindh. Poor women turnout in various parts of KP. 12:23 pm – ECP takes notice of live media talks by politicians saying that it is a violation of the code of ethics. It also instructed TV channels to refrain from airing media talks of politicians in order to avoid legal action. 12:15 pm- Rocket attack reported at BNP-Awami party camp in the Bonistan area of Panjgur district. 12:14 pm- PTI’s Amir Liaquat casts vote at Karachi NA-219 polling station. 12:12 pm – Former prime minister Raja Pervez Ashraf cast vote at Rawalpindi NA-58 polling station. 12:11 pm – President Mamnoon Hussain casts his vote along with the first lady in Karachi. Whereas, PTI Chairman condemns the attack in Quetta. PPP’s Faryal Talpur claims five Mangal Dhero polling stations lack stamps. 12:02 pm – Following a clash between the PTI and PML-N workers, polling was temporarily stopped in the NA-123 constituency in Lahore. 11:51 am – The Election Commission of Pakistan (ECP) takes notice of Imran Khan’s speech. The electoral body said that his speech is a breach of the election code of conduct. Whereas, PTI’s Babar Awan casts vote in Rawalpindi NA-57 constituency. 11:50 am – Following ECP’s notice, women allowed to vote in Peshawar NA-29 and PK-72 constituency. Meanwhile, PPP’s Saeed Ghani who was initially barred from voting; casts vote. 11:38 am – PTI chief Imran Khan casts his vote in the NA-53 constituency, from where he is also contesting polls. The cricketer-turned-politician urged Pakistanis to vote regardless of who they were supporting. 11:35 am – ANP chief Asfandyar Wali Khan arrives to cast vote in Charsadda. Sherry Rehman casts vote at Karachi NA-247 polling station. 11:32 am – Chief Justice of Pakistan Mian Saqib Nisar casts his vote in the NA-130 constituency. 11:23 am- Former KP chief minister Ameer Haider Hoti casts vote in Mardan. 11:15 am- JuD chief Hafiz Saeed casts vote at Lahore polling station. Former railways minister Khawaja Saad Rafique casts vote in Lahore. 11:12 am – Shehbaz’s Sharif daughter-in-law casts vote in Lahore. 11:10 am – Awami Muslim League (AML) chief Sheikh Rasheed talks to the media and expresses confidence about securing a victory in the polls. 11:03 am – A blast occurred near the Eastern Bypass in Quetta as DIG Abdul Razzak Cheema’s convoy was attacked near a polling station. 11 people killed and several were injured during the blast. 10:56 am – Women come out to vote in Union Council Dhoolar in Chakwal’s Talagang district after 40 years. 10:48 am – Three people were injured in an explosion outside a polling station in Larkana’s NA-200 constituency, near Shah Muhammad School. According to media reports, the blast targetted a PPP camp and the polling continued despite the attack. 10:37 am – Fake polling agents arrested in PB-22 Qillah Abdullah in Balochistan. 10:33 am- PPP Senator Taj Haider claims eight Karachi polling venues (NA-243) changed overnight, voters left confused. 10:27 am – ECP’s ‘check your vote’ service stops functioning as voters complain that they are not receiving a response from 8300 upon sending their NIC numbers to the SMS service. 10:10 am – Former defence minister Khurram Dastagir cast his vote in the NA-81 constituency in Gujranwala. 10:00 am – Caretaker Information Minister Ali Zafar casts vote at Lahore polling station. 9:59 am – Former prime minister Shahid Khaqan Abbasi cast his vote in the NA-56 constituency. Women barred from voting in the NA-29 (Peshawar III) constituency. 9:56 am – Pakistan Tehreek-e-Insaf (PTI) worker was killed during a clash with Awami National Party (ANP) in Swabi. The incident occurred outside a polling station for NA- 19 (Swabi II) and PK-47 (Swabi V). Meanwhile, NA-125 candidate Yasmin Rashid casts vote at Lahore polling station. PPP’s Faryal Talpur casts vote. 9:49 am – The Election Commission of Pakistan rejects Pak Sarzameen Party’s request to extend polling time in the NA-254 constituency. 9:40 am – Sindh caretaker CM Fazlur Rehman casts his vote in Karachi’s NA-247 constituency. PSP chief Mustafa Kamal casts vote at Karachi polling station. 9:33 am – A suspicious person tries to enter Lyari Bihar Colony polling station in NA-246. According to reports, the ‘suspicious person’ claimed to be a police officer. However, the security personnel took him to Chakewara Police Station and polling was suspended for 20 minutes at the polling station. 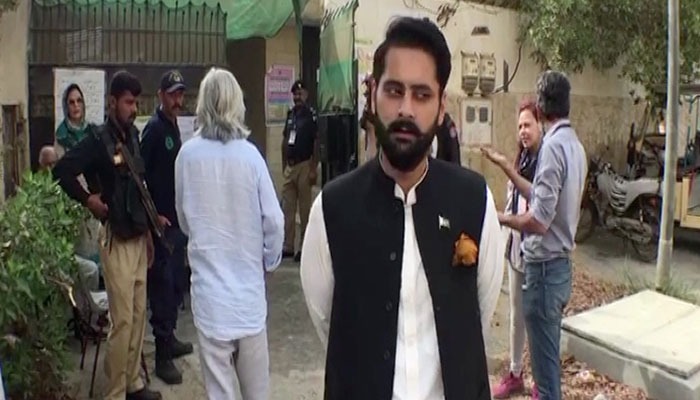 9:26 am – Independent candidate Jibran Nasir casts his vote in Karachi’s NA-247 constituency. He also urged people to come out and cast their vote. 9:22 am – PTI leader Shah Mehmood Qureshi cast his vote and said that ‘PTI will clean sweep all six seats in Multan’. 9:11 am – Muttahida Qaumi Movement-Pakistan (MQM-P) leader Farooq Sattar casts his vote in Karachi. While talking to the media MQM leader said that ‘today is the most important day in the history of Pakistan’s elections’, adding that, ‘next five years will be very important for his party’. He also asked the people on duty at each polling station to facilitate the voters as time is short and there is a large number of people registered to vote. 9:09 am – Shehbaz Sharif’s daughter-in-law and Salman Shehbaz’s wife, Zainab could not cast her vote in Lahore. It was reported that her name was not present in the serial list and returned without casting her vote. Moreover, Shehbaz and Salman cast their votes in Government Junior Model School, Model Town. 9:05 am – The Election Commission of Pakistan said that media accreditation is required to enter the polling stations. They have allowed cameras inside the stations, however, taking phones is strictly prohibited. 8:56 am – Former opposition leader in the National Assembly Khursheed Shah arrives to cast his vote at NA-207’s Islamia College polling station No 29. He expressed hope for ‘free and fair elections’ this time around. 8:35 am – Pakistan Tehreek-e-Insaf’s (PTI’s) NA-125 candidate Yasmin Rashid arrives at the polling station, exhorts people to vote. Moreover, voting fails to begin at Surjani polling station No 69 in NA-252. 8:34 am – Bakhtawar Bhutto and sister Aseefa Bhutto cast their vote in Nawabshah. Bakhtawar posted a picture on Instagram urging people and women, especially to come out and vote. 8:33 am – In PS-24 Sukkur constituency voting fails to begin on time at polling station 22. The polling process will commence shortly after the compilation of voting lists. 8:25 am: Jamiat Ulema-e-Islam’s (JUI-F) Chairman Maulana Fazlur Rehman cast his vote in Dera Ismail Khan’s NA-238. In his message to the public, he said that vote is people’s responsibility, and it is important to exercise the right to vote. “Vote with sincere intentions,” he added. 8:10 am: Pakistan Tehreek-e-Insaf (PTI) leader Asad Umar cast his vote in Islamabad’s NA-54 constituency. Talking to media, he said the change will begin today. 8:07 am: Pakistan Muslim League-Nawaz President Shehbaz Sharif casts his vote in Model Town, Lahore. Talking to media, Sharif urged the people of Pakistan to vote for PML-N to change the destiny of this country. “Today is the day when PML-N will emerge as victorious as the majority of the people want to vote for PML-N,” he said. 8:00 am: Polling begins across the country.